Discover Secret Gardens, decipher ancient riddles on tombstones, visit a disturbed Indian burial ground, observe the stars and planets through a university telescope, frown at a bronze statue of Lenin, harvest mastodon food in Central Park, enjoy the aroma of a roomful of dirt, find a Venetian palazzo above a former stable, spot the forbidden island that was once declared a sovereign nation by a guy in a rowboat, track down a townhouse concealing a subway tunnel, walk under the canopy of the primeval forest, read a memorial plaque to an event that happened in another dimension, fall into a trance before a piece of subway art that flickers and moves, have your bicycle blessed in church. New York offers endless opportunity to step off the program and peer into the city's fascinating past and present. 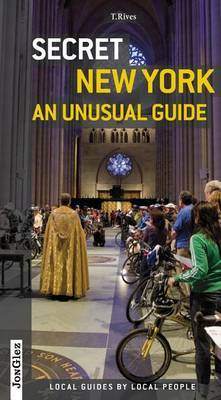 Secret New York - An Unusual Guide is an indispensible resource for those who thought they already knew everything about America's metropolis, or want to begin exploring it hidden places.